Confirming a recent rumor, Toyota has announced plans to build a faster, more powerful version of the Yaris hatchback aimed right at the Ford Fiesta ST. 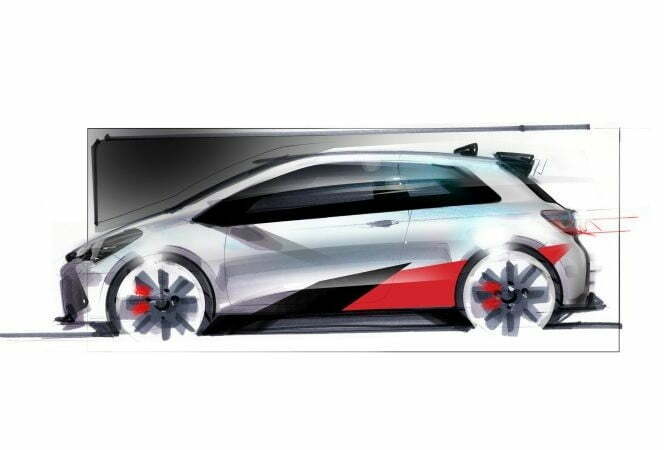 The model might be badged Gazoo, the name of the auto-maker’s official racing team. An official teaser sketch suggests the car will be based on the two-door variant of the Yaris, and it will stand out with a race-inspired body kit that includes a deeper front bumper, side skirts, and a large wing out back. Engineers are applying lessons learned during the development of the World Rally Championship-bound Yaris to the new performance hatch. What will power the Yaris Gazoo is a major point of debate. The standard model uses a 1.5-liter, four-cylinder engine rated at 106 horsepower and 103 pound-feet of torque — not the kind of figures that get enthusiasts excited. At the other end of the spectrum, the WRC car benefits from a turbocharged, 1.6-liter four that pumps out 380 horses and 313 pound-feet of twist. Don’t expect the 380-horsepower engine to reach mass production. However, it’s reasonable to assume the Yaris Gazoo will boast about 200 horses under the hood in order to keep up with rivals like the aforementioned Fiesta ST, the Opel Corsa OPC, and the Volkswagen Polo GTI. Front-wheel drive and a manual transmission will both come standard; all-wheel drive looks unlikely at best for packaging and cost reasons. Toyota’s European division previewed the Yaris Gazoo on its official Twitter account. The hot-rodded model is a shoe-in on the old continent, but it’s too early to tell whether it will cross the Atlantic and join the regular, economy-focused model in Toyota’s U.S. showrooms. We’ll find out more about the Toyota Yaris Gazoo in the coming weeks, and we expect to see it in the metal for the first time during next year’s Geneva Auto Show.